Experiment with blurring images you already have. Graffiti / the place where you took the image that is now high contrast or a different image from the same place. Some beautiful long exposures. The Thames looks serene. Make sure you have annotated the new photographers that have been included over the last two weeks. Context (when / where) Technique (How) Intentions (Why). It's really difficult to follow the development. Please state for each set- what were your intentions, what went well, even better if and what's next. For the very top marks you need to be explicit, drawing connections with relevant photographers. Love where you project ends at the mo but PLEASE put it all in some context. There's a great deal of photographers but not really enough photography. What is the fourth set meant to show us? Fifth set...? You have missed lessons to take photos but where are they? 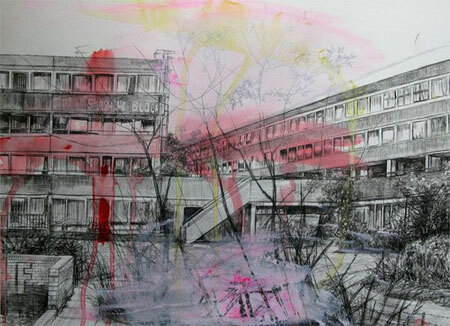 What about over laying photographs of estates with line drawings? Many of these blocks where built as new, modern and utopian ways of creating community. The Heygate estate, for example, was based on the work of architect, Corbusier who believed in that an efficient, industrialized architecture was the only way to avoid class-based revolution. Unfortunately this 1970s estate gradually developed a reputation for crime, poverty and dilapidation. Could your drawings show the estate you choose to photograph as it was intended to be? The drawings could be in the style of Laura Oldfield Ford. Also look at the work of Laura Oldfield Ford- similar ideas to the Hepher above middle. Photograph Modern buildings (ie- near London Bridge / City Hall.) Collage (physically or digitally) parts of your photographs together to create this abstract response. Make sure that the lines line up with a central point of perspective.